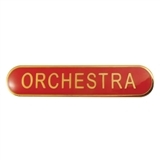 These great Orchestra Badges are available in three colours. 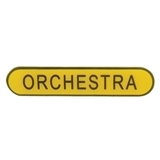 They make your orchestra members easily recognisable in the school, and can inspire other pupils to become part of the orchestra. Each badge is 45mm x 9mm with a black metallic finish. Sold individually, each metal badge has a pin fastening on the reverse.